The world of Information Technology keeps progressing from one invention to another, in the wink of an eye. This pace has created a space for cross-border communication platforms and has prodigiously increased the need for real time data transfer without transmission loss or theft. Here rises the importance of strong and secure LAN cables that would enable data transfer with amazing speed and efficiency; and at the top in the priority list among system integrators across India is the name V-Guard. 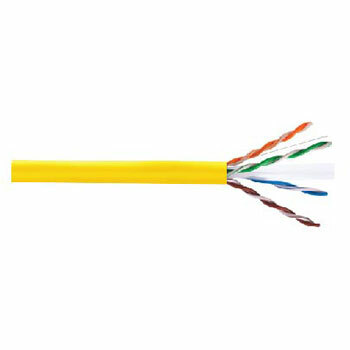 V-Guard Cat 6 cables feature the most sophisticated crosstalk and system noise characteristics. These technologically advanced cables are compatible with the most superior networking switchgears and also provide express-speed performance of up to 250 MHz Its unique zero interference feature assures that no novice cross talk is experienced during data transfer process. A preferred name across IT hotspots such as Bengaluru, Hyderabad and Chennai, V-Guard Cat 6 cables are widely acclaimed for their endurance capacity. V-Guard LAN cables enable data transfer without transmission loss or theft. These technologically advanced cables are compatible with the most superior networking switch gears and also provide express-speed performance of up to 250 MHz Its unique zero interference feature assures that no novice cross talk is experienced during data transfer process. Packing : Available in 305 meter packed in easy pull box.